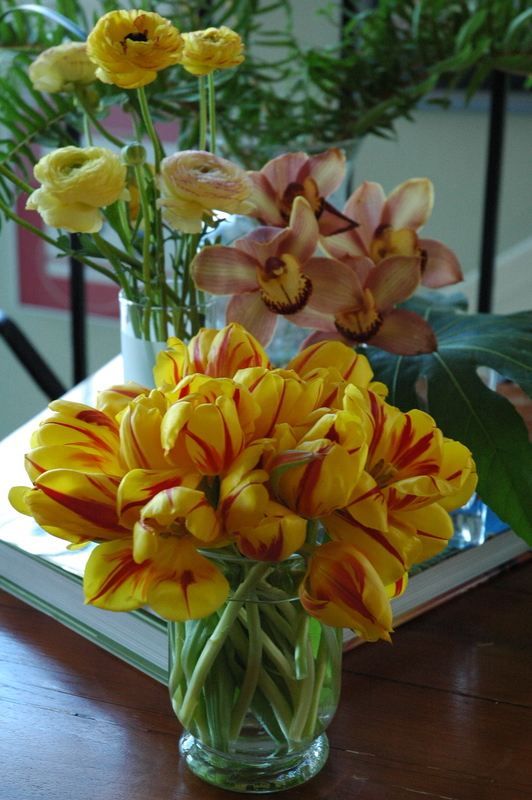 There are flowers in almost every room of my place. You’d think there had been a wedding or a funeral, or perhaps I’d finally opened a florist (in my house). It just happened this way. Between receiving a bounty of beautiful blooms for my birthday, having flowers before this, as well as collecting my usual round-up of outside cuts. Oh, and then I picked up a few more bunches at the Saturday Farmer’s Market. 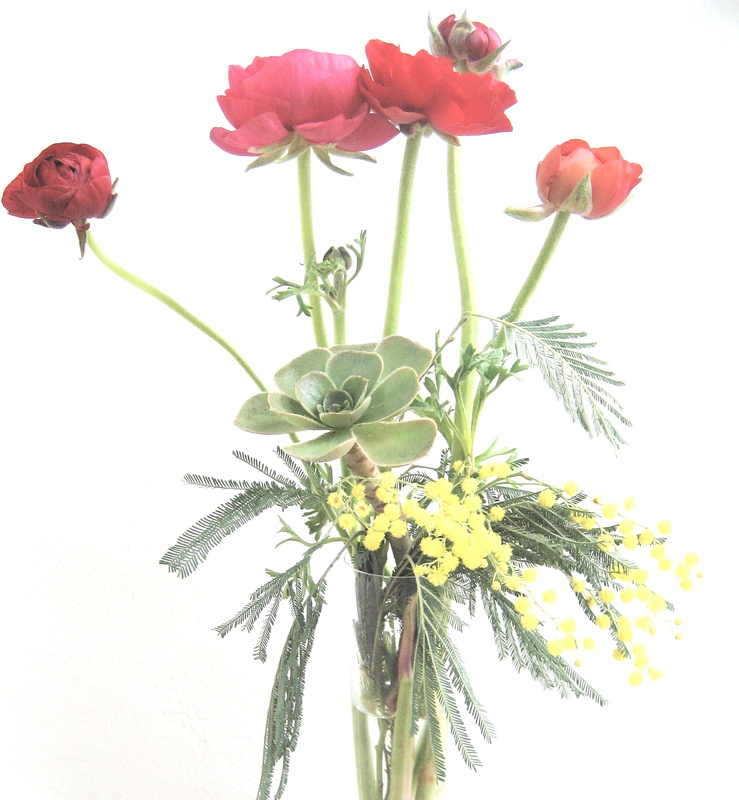 How could I resist lemon-yellow Ranunculus and pink and red Sweet William? Surely not. Below are an assortment of scattered blooms that are currently bringing me joy. 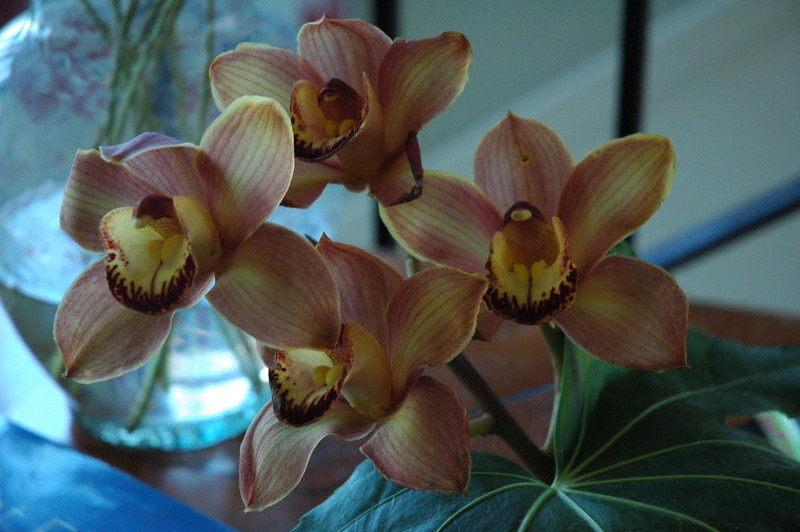 Incredibly long-lasting cut Cymbidium orchids that I acquired the beginning of the April. 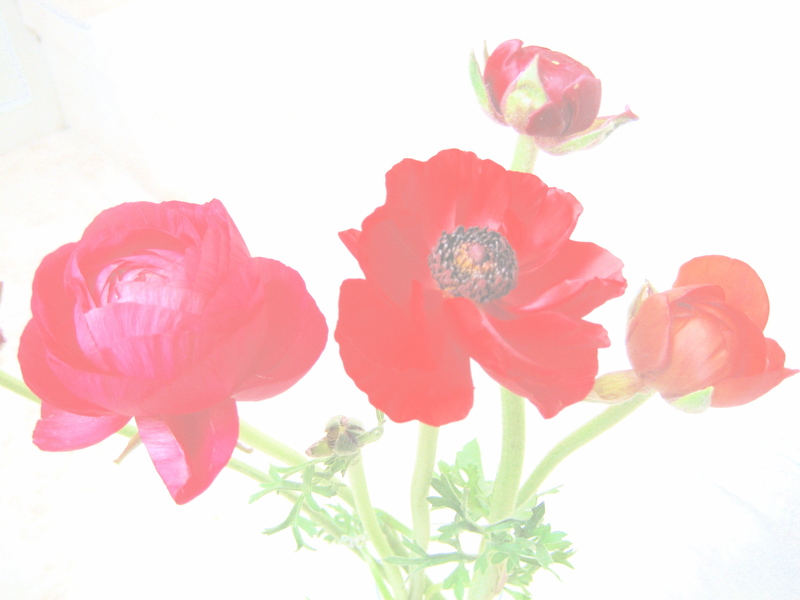 A few blooms have since fallen, which I happily have floating in another vessel filled with shallow water. Due to the sudden rise of temperature the tulips once dainty and delicate exploded in great form. I expected them to. 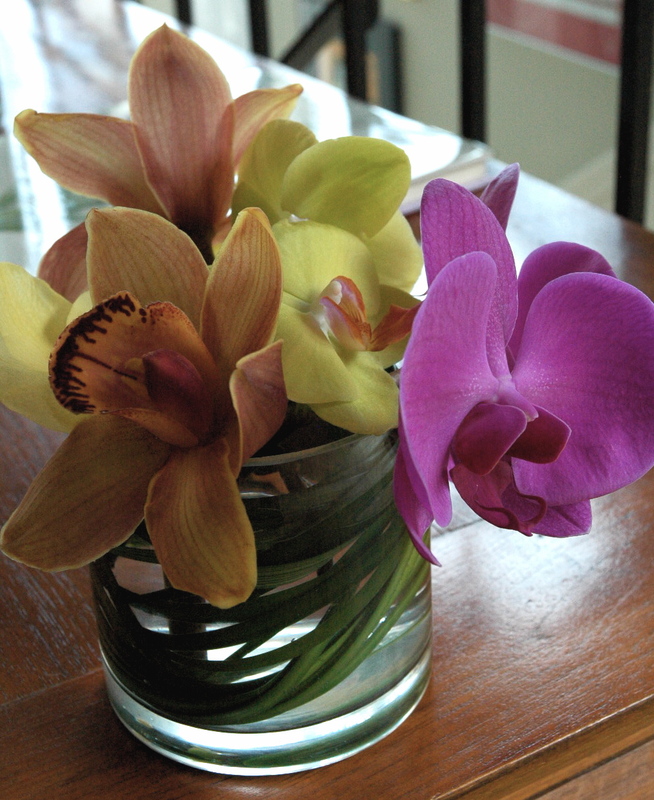 I removed them from the Birch arrangement they were featured in and fastened them into their own vase. Bound tightly and cut short. 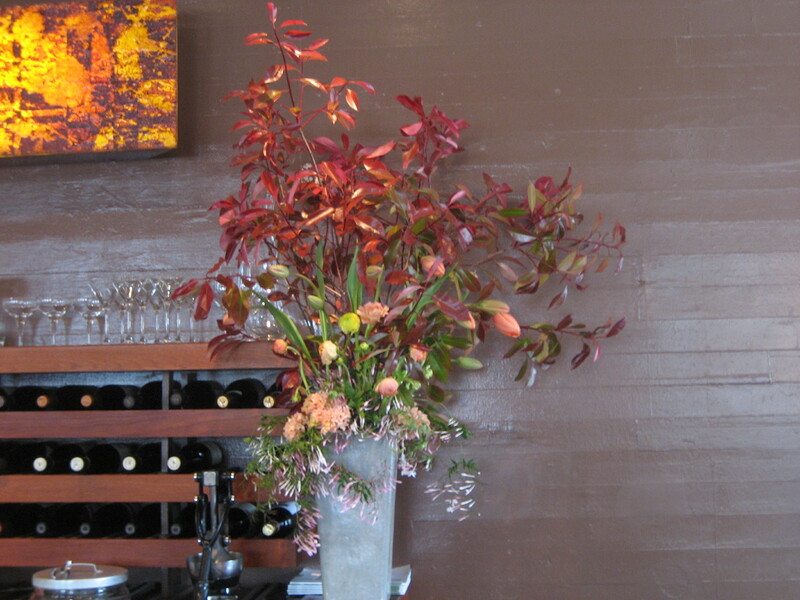 Daffodils and Pincushion Protea remain in the fabulous Birch arrangement. Sadly the hydrangea perished during the sudden heat rise. The remaining few look quite nice together. I like the complimentary colors yet contrasting textures. 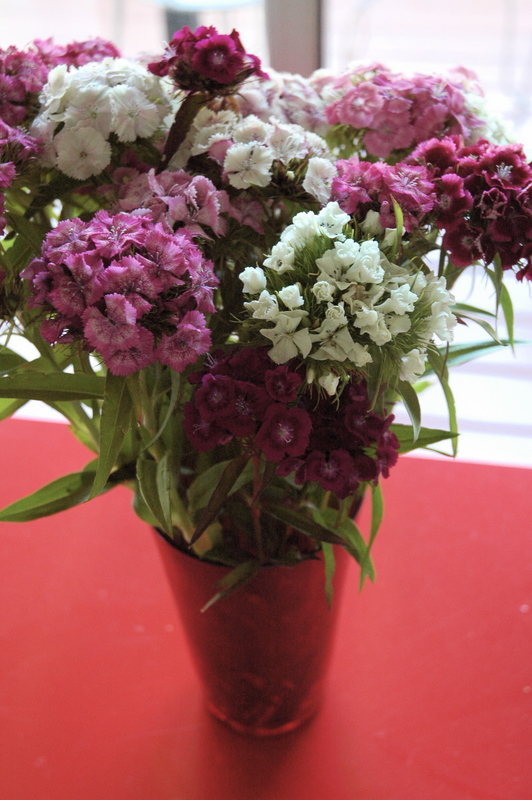 Here is Sweet William (also known as Dianthus) from the Ferry Building Farmer’s Market. Sweet William reminds me of Texas for some reason.I can’t help associate it with the variety grown by The Arnosky family of Texas Specialty Cut Flowers . They grow a mean Dianthus, big and strong( as you might expect a Texas bloom to be) and rich in color. 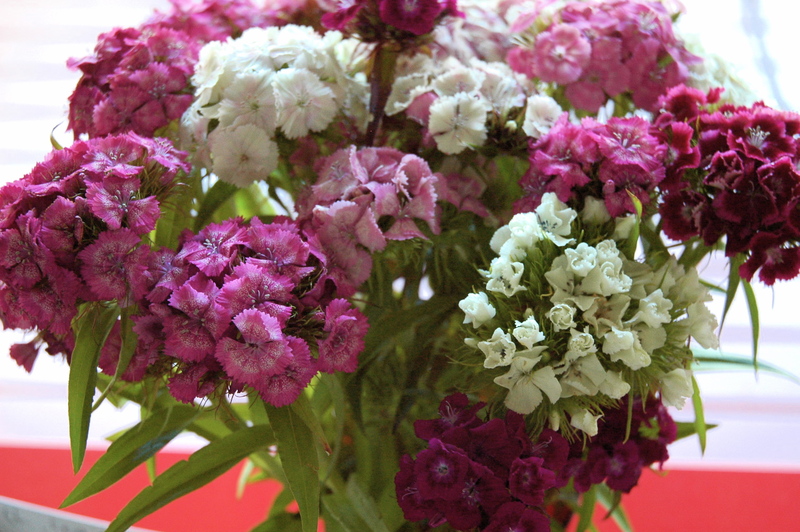 Many use Sweet William as a filler flower. While it does work well as an accent to other flowers, I happen to like it just on its own. 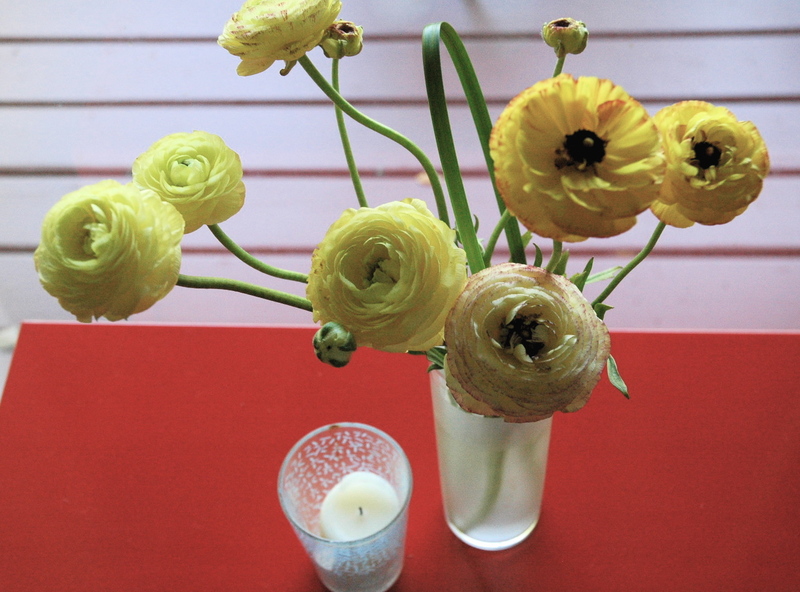 And bright yellow Ranunculus (poor man’s Peony) whose blooms just seem to open and open….I am enjoying ranunculus season right now, though I can’t seem to track down that mixed orange and hot pink variety . It is a personal favorite of mine. 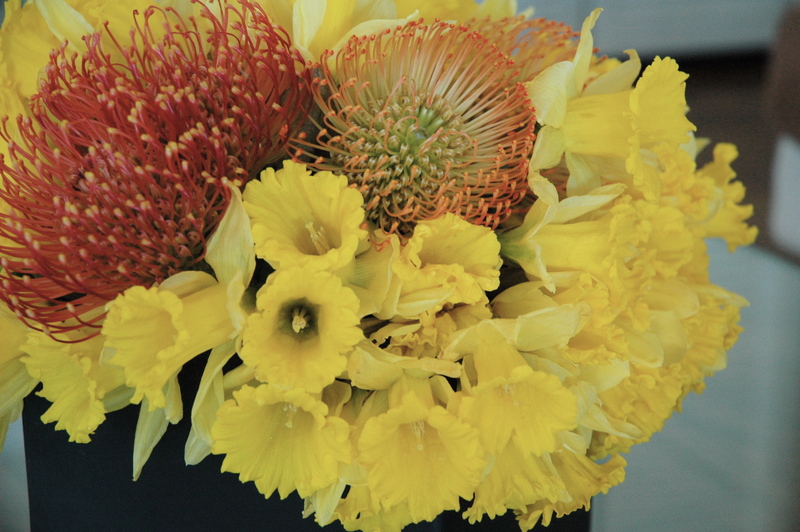 These blooms will also work well as floaters. 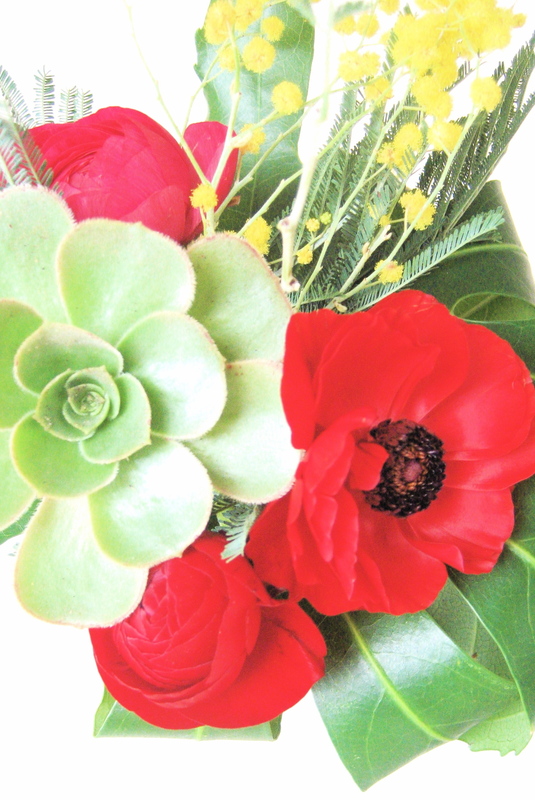 It is officially Spring and there is no escaping the abundance of Tulips and Ranunculus at the Market. 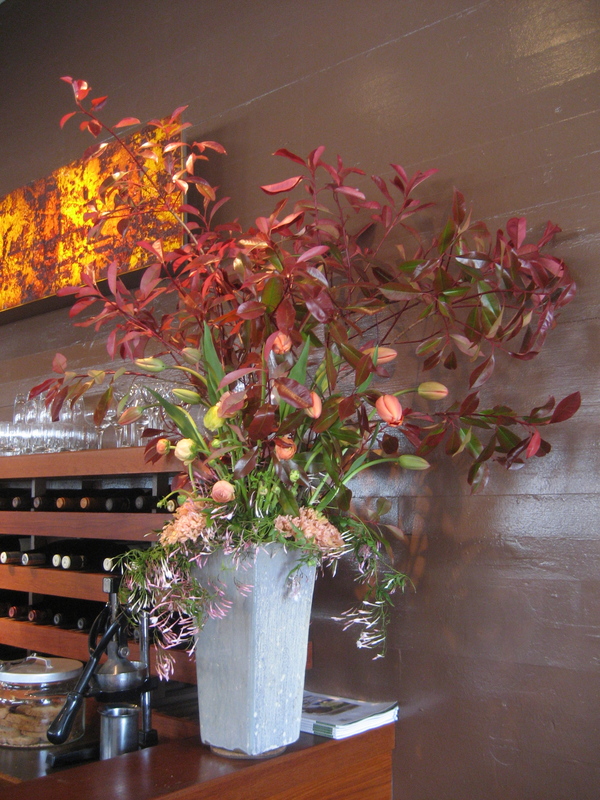 This arrangement also features cut Jasmine (trailing around the base) and peach colored Hyacinth- clustered above the Jasmine. This will look stunning once the blooms have all opened. Spring fragrance at Coco this week.